BEAL Testing Services is able to provide you with accurate and economical thermal measurements of solid and loose fibre products for both research and certification purposes. Special low prices apply to research work. Many other materials can be measured as well sometimes with adaption of the standard insulation test method – AS/NZS4859.1 – to achieve useful data. 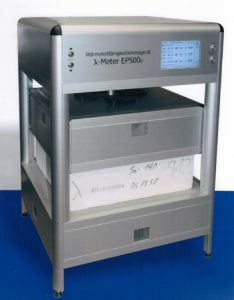 The new Lambda Thermal Conductivity Testing machine uses an embedded PC for determining absolute value measurements using the guarded hot plate method according to ISO 8302, DIN EN 1946-2, EIN EN 12667 and ASTM C177 (DIN 52612) which are referenced in AS/NZS4859.1. It is not a heat flow meter and, therefore, it offers higher accuracy and reliability than most other testing machines. In many cases the time for testing is reduced too. Measurements based on ASTM C518 will not be as accurate as those measurements based on ASTM C177 which the Lambda machine is based. For an explanation describing the differences between a ‘heat flow meter’ and a ‘guarded hot plate’ request a copy of the Introduction to the Lambda Thermal Conductivity Machine booklet by calling BEAL or by e-mail. To obtain a quote for testing your product or range of products, contact us now!